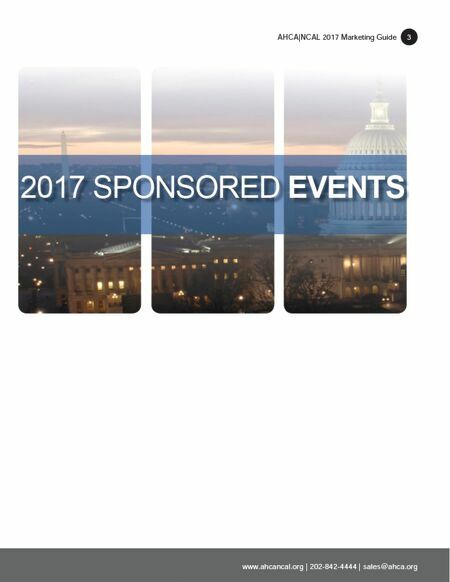 AHCA|NCAL 2017 Marketing Guide 2 © American Health Care Association/National Center for Assisted Living A Broad-Based Membership AHCA/NCAL is the largest asociation representing long term and post- acute care facilities in the country. ederation of 49 tates and District of Columbia affiliate offices National headq uarters located in ashington, .C. 2,915 (22.3%) 2,915 (22.3%) 2,915 (22.3%) 673 (5.2%) 673 (5.2%) 673 (5.2%) 9,473 (72.5%) 9,473 (72.5%) 9,473 (72.5%) Total: 13,061 Total: 13,061 Total: 13,061 SNF SNF SNF AL AL AL AL/SNF AL/SNF AL/SNF Membership Profile Council for Post Acute Care(CPAC): Comp rised of senior leaders from the nation' s largest comp anies 4, 000+ eds) . Regional Multifacility Council: Comp rised of senior leaders from multifacility organiza tions 10+ uildings) . Independent Owner Council: Comp rised of owners from across the country op erating less than 10 uildings. 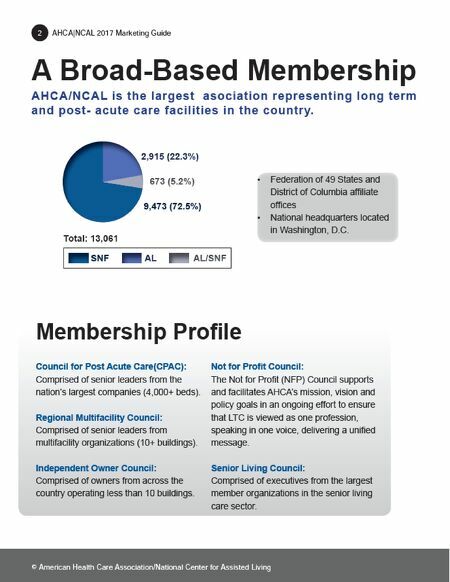 Not for Profit Council: The Not for Profit (NFP) Council supports and facilitates AHCA' s mission, vision and olicy goals in an ongoing effort to ensure that LT C is viewed as one rofession, speaking in one voice, delivering a unified message. Senior Living Council: Comp rised of exe cutives from the largest memb er organiza tions in the senior living care sector.